Our exclusive interview with Brian Blessed produced many a memorable moment as he took us through his life and passions in his own inimitable fashion. One moment that caused quite a stir with the media was when Mr Blessed made a blue comment about his manhood. This led to no fewer than 14 news outlets covering the story across the British Isles. 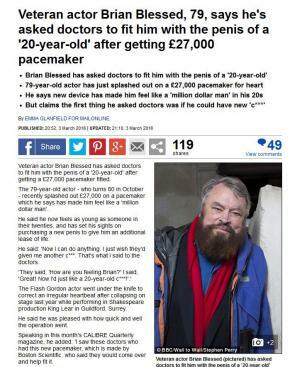 In the interview, CALIBRE asked Mr Blessed about how he was feeling, following on from having a pacemaker fitted — it being a few months since the actor collapsed on stage during a performance of King Lear — and he replied in his trademark booming voice: “It was all finished before I knew it. I just immediately felt 20 again. Now I can do anything. I just wish they’d given me another c**k. That’s what I said to the doctors! Naturally, the red-top newspapers loved this cheeky comment with the Daily Mirror, Daily Express and Daily Star all featuring the full story online. Further coverage was to be found in the Daily Mail, TV Guide and VICE. This has put the CALIBRE brand and name in front of millions of unique readers and viewers and serves to cement our place as the number one men’s magazine for the mature modern man. ‹ CALIBRE Quarterly Issue 8 Available Now!